Terror victims all held dual US or British citizenship; funerals draw thousands. 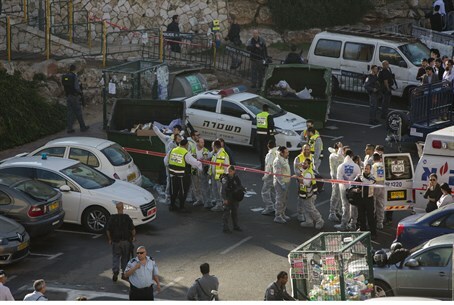 A media gag order has been lifted on the full list of victims of Tuesday morning's massacre in Har Nof, Jerusalem - where two Palestinian Arabs brutally murdered four people and wounded eight others as they were in the midst of morning prayers. The four victims were Rabbi Moshe Twersky, hy"d, 'Rosh Kollel' for the 'Torat Moshe' yeshiva; Rabbi Kalman Levine, hy"d; Aryeh Kupinsky, hy"d, and Avraham Shmuel Goldberg, hy"d.
Kupinsky (43) lost his 13-year-old daughter Chaya Hana two years ago. Goldberg (68) made aliyah (immigration) to Israel in 1991, and leaves behind a wife and six children. Rabbi Levine (50) leaves behind a wife and nine children, as well as five grandchildren. Rabbi Twersky, a grandson of Rabbi Joseph Dov Soloveitchik and a direct descendant of Rabbi Chaim of Brisk, was born in the US and made aliyah in 1990 with his family. He leaves behind a wife, five children and ten grandchildren. Rabbi Shmuel Auerbach, a prominent head of the Lithuanian hareidi community, eulogized the rabbi saying "he was a great and holy man. He was so close to G-d in his holy life and was murdered in the middle of his prayer, with the tefilin (phyllacteries) on his head." Rabbi Twersky's funeral was to be held at 2 p.m. at the Torat Moshe yeshiva in Sanhedria. The funeral services for Rabbi Levine, Mr. Kupinsky, and Mr. Goldberg began at 3 p.m. at the synagogue in which they were murdered, the Kehillat Bnai Torah Yeshiva Synagogue in Har Nof. Thousands attended the funeral of the three, including President Reuven Rivlin.